A.Navien of third year, civil engineering department participated in the “ALL INDIA STUDENT DESIGN COMPETITION – 2017” conducted by National Design and Research Forum, the Institution of Engineers (India). 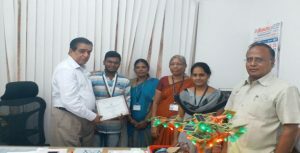 He has been awarded “GOLD MEDAL” in civil discipline for the design project “SOLAR TREE”. Solar energy is most advantageous for countries having very less space to produce energy efficiently. This solar tree was designed based on “SPIRALLING PHYLLOTAXY” technique to satisfy pressing environmental and social demands for urban lighting and power supply. This entry was posted in Sona Civil News and tagged SONA CIVIL STUDENT BAGGED GOLD MEDAL IN “ALL INDIA DESIGN COMPETITION – 2017” on November 3, 2017 by Sona Civil Department.